100% Freshly Pressed Juice! Pink Grapefruit is loaded with healthy goodness! 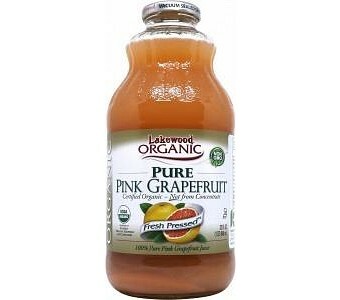 A glass of pure pink grapefruit juice will provide two full servings of fruit. Pink grapefruit contains substantial amounts of unique anthocyanins, essential micro-nutrients, minerals, valuable polyphenols, and the anti-oxidant Vitamins A and C. The nutrients in grapefruits are essential for the production of the protein, collagen, which are beneficial in the processes of tissue repair and healthy skin. Lakewood Juices are freshly pressed, bottled and vacuum sealed in certified organic facilities.